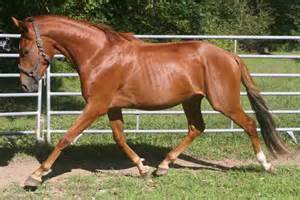 Your horse gallops, jumps, collects, turns and extends his stride with power from his hindquarters. And his sacroiliac (SI) joint?the ?meeting place of his pelvis and spine?is critical at every stride. It transfers the action of his hind legs to his back, translating the push into forward motion. Given the forces that this joint handles day in and day out, it’s not unusual for horses to develop SI pain. The trick is recognizing the problem: SI injuries are notoriously hard to pin down, with subtle and confusing signs, easily mistaken for other physical or even behavioral problems. Even a “hunter’s bump,” a raised area at the top of the croup that’s often thought to reveal SI trouble, isn’t a reliable sign. How can you tell if your horse develops SI pain? And, more to the point, what can you do to help him if he does? For this article, we asked Kevin Haussler, DVM, DC, PhD, of the College of Veterinary Medicine and Biomedical Sciences at Colorado State University, for help in answering those questions. Who’s at Risk? Any horse can injure his SI joint in a fall or some other accident. The injury may leave the joint less stable than it was originally, so it can become a source of chronic pain. Performance horses may develop SI problems through simple wear and tear?and the more mechanical stress the joint comes under, the greater the risk, Dr. Haussler says. SI problems are fairly common. In one recent survey, these problems accounted for more than half of 124 horses presented for back problems at the University of Minnesota equine clinic. Show jumping and dressage seem to be especially hard on the joint, according to a study carried out by Sue Dyson, FRCVS, and others at the Center for Equine Studies, Animal Health Trust, Newmarket, United Kingdom. That study analyzed records of 74 horses seen for SI pain at the center. Dressage horses and show jumpers accounted for almost 60 percent of the group. Slightly more than half were warmbloods, suggesting that breed may play a role. And horses with SI pain tended to be taller and heavier than average, another sign that mechanical stress is an important factor. Under stress, Dr. Haussler says, the joint can be injured in several ways. The SI ligaments can tear, just as ligaments and tendons in a limb can give way under stress. And the joint itself, like the hock or any other joint, can become inflamed. Over time, osteoarthritis develops?cartilage wears away and bone remodels. Thoroughbred racehorses sometimes get pelvic stress fractures directly over the SI joint, and those need to be differentiated from SI joint arthritis. What You’ll See SI problems are hard to spot. The joint has almost no range of motion and is buried under layers of muscle and fat, so you can’t really see or feel it. And signs of SI pain are often frustratingly vague. Your first hint of trouble may be a change in your horse’s performance or attitude?he’s not working at his usual level or seems unwilling to work. He lacks impulsion behind, and his quality of movement isn’t what it was. Your farrier may tell you that your horse is difficult to shoe behind. You may see other signs as well. Some may show up when your horse works on a longe line or in-hand. But ?often signs are worse when your horse is ridden or is asked to canter, because these demands call for more hind-limb ?impulsion and put more stress on the SI. Sometimes the signs are apparent only when your horse is ridden, and sometimes they are felt only from the saddle. Horses with SI problems may not look lame, even to a skilled observer, but they often feel worse to a rider. is reluctant to move forward. tends to throw his rider upward and forward. is reluctant to work on the bit. has trouble with lateral work, such as shoulder-in and half-pass. is stiff and crooked at the canter. 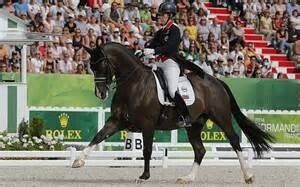 changes his leading hind leg (swaps off behind) at the canter. has trouble with flying lead changes. Working your horse in-hand (on a firm surface), you may also see that he travels with a wide-based gait behind and has trouble with foot placement on circles. A “hunter’s bump” just indicates a prominent bony crest?the tuber sacrale underneath the muscles at the top of the croup. Prominence on one or both sides may be normal for a particular horse, Dr. Haussler says, but if your horse has pain, muscle spasms and joint stiffness in the SI or pelvic region, then the bump is likely to be significant. It may signal subluxation a partial displacement of the tuber sacrale. A bone scan (nuclear scintigraphy) can reveal osteoarthritis. Your horse is ?injected with a radioactive substance that accumulates in areas of active bone remodeling, and a gamma camera tracks the substance as it moves through his body. Ultrasound scans can detect damage to ligaments. Transrectal ultrasound (the technique used for equine pregnancy checks) may reveal irregular SI joint margins?a sign of arthritis?as well as damage to the ventral (lower) SI ligament. Ultrasound or radiographs can help identify a displaced tuber sacrale. Even with these tools, it’s sometimes hard to figure out the exact nature of an SI problem. But knowing the cause of your horse’s pain will increase the odds of ?successful treatment and make a relapse less likely. Reduce inflammation. This is the first step in treating SI pain. Your veterinarian may prescribe a course of oral phenylbutazone (bute) or another nonsteroidal anti-?inflammatory drug. If arthritis or ligament damage is diagnosed, local injections of corticosteroids can help reduce pain and inflammation. The injections are similar to those used in other inflamed joints, such as the hock. Reduce exercise. Limited exercise helps by strengthening the muscles that surround the joint?but too much work will aggravate the injury. Your veterinarian can help determine how much and what type of exercise is best for your horse. The program might call for light work in-hand, on the longe line or in a round pen for several weeks. If your horse is comfortable with that, you might start light riding at the walk and then at the trot. Increase work slowly, ?watching carefully for signs that your horse is uncomfortable or ?unwilling. Allow turnout. Stall rest isn’t recommended for most SI injuries. In most cases, turnout in a small paddock with good footing is helpful. Avoid deep mud, large rocks, poor footing and steep hills, which may aggravate SI problems. Arthritis in the SI joint can lead to chronic, low-grade pain. In this case, careful management will help keep your horse comfortable. Use a progressive (gradually increasing) exercise program to strengthen and supple his hindquarters. Tailor the length, frequency and intensity of the work to suit your horse, Dr. Haussler says, backing off if your horse seems unwilling or if other trouble signs return. 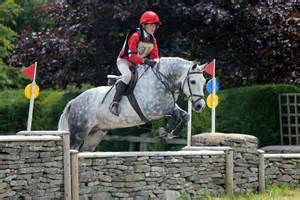 Use cross-training techniques?for example, alternate flatwork, hacks in the field and cavalletti work to avoid constant or repetitive stress on the joint. Avoid activities that are especially hard on the SI region: jumping, galloping, abrupt transitions, tight turns and circles. Turn out your horse as much as possible. Moving around at liberty will help him maintain flexibility, reducing joint stiffness. Acupuncture may be useful for pain control in the SI region. Therapeutic exercises can help restore impulsion and coordination in the hind limbs. Hind-limb stretching exercises that draw the leg forward (protraction) and backward (retraction) may help relax spastic muscles or contracted connective tissue and restore joint mobility. Chiropractic or osteopathic techniques may be helpful in chronic cases to restore normal, pain-free joint mobility. Massage may help relax muscle tightness in the croup or upper hind limbs. The outlook for horses with SI injuries depends on the severity and duration of the problem, Dr. Haussler says. A horse with a mild injury should recover and has a good chance of returning to full work. Horses with more severe cases of osteoarthritis or ligament damage may return to a low level of exercise, but their outlook for returning to high performance isn’t so good. As a rule, a horse who responds well to treatment has a better chance of full recovery than one who does not. This entry was posted in Equine, Equine Massage, Injury, Injury Prevention, Pain Relief, Sports Massage, Stress Point Therapy, Structural Integration and tagged acupuncture, arthritis, canter, cartilage, chiropractic, dressage, flying changes, half pass, hunter's bump, inflammation, joints, jumping, lameness, ligament, movement, muscles, sacroiliac, shoulder in on May 18, 2016 by Beverly Jacobs. Massages feels amazing, especially after a grueling workout—and their benefits aren’t just skin deep. Soft tissue massage is exceptionally good for bone-weary athletes and people with inflammation-related chronic conditions like arthritis and muscular dystrophy, according to research from McMaster University. Vigorous exercise causes small tears in your muscle fibers, and your body’s natural repair process naturally leads to inflammation and soreness. To see if massage truly aids recovery, the researchers biopsied volunteers’ legs over the course of three sessions—once while at rest, a second time after they’d vigorously exercised on a stationary bike and received a 10-minute massage on one thigh, and a third biopsy two and a half hours after the second to track the repair processes between the massaged and un-massaged legs. Unsurprisingly, massage reduced the production of cytokines, which play a critical role in inflammation, and stimulated mitochondria—the tiny powerhouses inside your cells that convert glucose into energy for cell function and repair. So make sure to schedule regular massages; your muscles will adapt better to the demands of increased exercise. This entry was posted in Equine Massage, Human, Injury Prevention, Pain Relief, Performance Enhancing Massage, Sports Massage and tagged arthritis, exercise, inflammation, massage, muscle fibers, soreness on October 21, 2015 by Beverly Jacobs. I ask health care professionals to do one thing, just try it. Pick one client with chronic musculoskeletal pain, skip the ice, skip the NSAIDs and try to use light exercise as a repair stimulus. Then, try skipping the ice on a client with an acute mild injury. The outcomes might surprise you. This entry was posted in Equine, Human, Injury, Pain Relief, Performance Enhancing Massage, Sports Massage and tagged fracture, healing, ice, inflammation, injury, lymphatic, muscle, NSAID, RICE, swelling on June 8, 2015 by Beverly Jacobs. Cold laser therapy offers a wide range of options for tissue therapy, wound healing, pain management, and improved circulation. 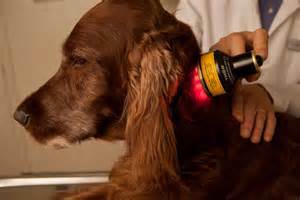 Cold laser therapy is a game changer for many pets suffering from painful injuries. This technology allows us to successfully treat many injuries including tissue damage, inflammation, wounds, and even scars with minimal invasion. The technology has been used in Europe since 1970 to promote healing, but has only been approved by the FDA for use in the U.S. since 2002. It is only recently, though, that U.S. veterinarians have begun using it to treat many different conditions that affect pets today, such as fractures, ligament and tendon injuries, post-surgical incisions, arthritis, nerve injuries, sprains, muscle strains, abrasions, lesions, and more. Cold laser therapy is non-invasive and makes use of light in order to stimulate activity or regeneration in cells in addition to increasing blood circulation. Unlike hot laser treatments that target tissue deep beneath the skin’s surface, cold laser therapy treats injuries or damage on or near the surface – without the risk of cutting or burning from the lasers. Most conditions require between three and eight treatments, though I have seen great improvement after the first laser session. Most animals enjoy their seession: many fall asleep or thoroughly relax. This entry was posted in Canine, Cold Laser, Equine, Human, Injury, Pain Relief and tagged arthritis, bleeding, circulation, fracture, inflammation, lesion, ligament, muscle, nerve, scar, sprain, swelling, tendon, wounds on June 7, 2015 by Beverly Jacobs. Could Your Horse Do Better at Shows? 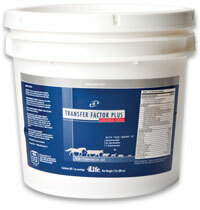 If your horse has squeaky clean X-rays and MRI’s, does that mean the horse is pain free? You can ask the same question about your own body. The answer is, of course, no. If you play tennis or ski or ride or dance or even garden, you know you can hurt without being injured. The same goes for your horse. What surrounds the skeleton is of more importance than the skeleton itself. Until fairly recently, the fascia has been largely ignored by most health care professionals, and cannot be seen in standard tests such as X-rays and MRIs. Strains, due to injuries and accidents, get lodged in the body when a horse compensates movement during the healing process. Unless these compensations are fully released and realigned, they eventually become chronic strains that limit coordinated movement and cause pain. Horses need massage just as much, if not more, than any human athlete, since they have to carry someone on their back! The benefits of massage are the same for horse or human, with increased suppleness, better range of motion, and quicker recovery from injury. This therapy is so much more than a relaxation massage. It improves performance and longevity in whatever sport or casual use they are involved in. My biggest thrill is to help an animal become pain free. They behave and perform differently. Their whole personality and energy can change. And the results of the massage can be long lasting. This entry was posted in Equine, Equine Massage, Human, Injury, Injury Prevention, Myofascial Release, Pain Relief, Performance Enhancing Massage, Sports Massage, Stress Point Therapy, Structural Integration, Trigger Point Therapy and tagged MRI, skeleton, Xrays on March 13, 2015 by Beverly Jacobs. The usual approach to treating sore muscles is to use liniment for a relaxing rubdown, or use a high tech blanket, or maybe do some leg stretches. And if none of those techniques work, what is next? Trigger points, or muscle knots, are small patches of contracted muscle fibers that cause aching and stiffness. When activated through strain or injury, they cause pain either at the site itself, or refer it somewhere else in the body. Thousands of muscle fibers contract to create movement. Sometimes muscle fibers can tear, leading to tension, swelling, and heat. What may begin as a small numbers of fibers, barely noticeable, can become a progressive problem as the micro trauma spreads to adjacent muscle fibers. Conscientious riders will be aware of the smallest change in movement or behavior and take action before the problem becomes a major injury. This entry was posted in Equine, Equine Massage, Injury, Injury Prevention, Myofascial Release, Pain Relief, Stress Point Therapy, Trigger Point Therapy and tagged liniment, muscle fibers, swelling on February 20, 2015 by Beverly Jacobs. Cold laser therapy works by altering or stimulating cellular function. The light energy penetrates, depending on the wavelength, and affects cells and blood vessels. 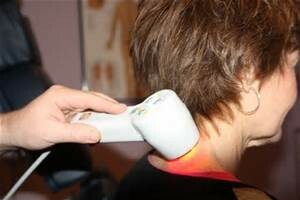 The laser can block a nerve’s ability to send a pain signal to the brain, increasing blood flow or decreasing swelling. It may also significantly speed wound healing. Some exciting new areas of study for laser healing are range of motion, baldness, jaw clicking, Parkinson’s, Alzheimer’s, and stress. treating stress, anxiety and depression with cold laser therapy. The protocol for stress combines ancient Chinese medicine and laser technology that’s used on acupressure points to boost endorphins and dopamine. These chemicals naturally help your body reduce the physical effects of stress. Lasers have been shown to speed healing time by about 50%. This entry was posted in Canine, Cold Laser, Equine, Pain Relief, Sports Massage, Stress Point Therapy, Trigger Point Therapy and tagged Alzheimer's, anxiety, blood vessels, cells, endorphins, Parkinson's, stress, surgery, wound on January 13, 2015 by Beverly Jacobs. The nervous system remembers the pain and trauma of an injury. With your horse, you might see this as stiffness at the beginning of a workout, or extreme caution. When a rider tells me their horse just “doesn’t want to jump anymore”, I suspect muscle pain and get to work looking for it. Trauma accumulates in the body, starting at birth. Have you considered how much trauma there is for a foal during the birth process? The results can set up tight muscle patterns that last a lifetime, unless manually removed. Myofascial release aims to relax contracted muscles, improve blood and lymphatic circulation, and stimulate the stretch reflex in muscles. Often I stand back after just one bodywork session and see that the body is already reorganizing itself. The body looks less chopped up into sections and more of one flowing form. During a session the body of the horse is educated in the process to move the way it is supposed to: in balance and without restrictions. If the connective tissue that covers every muscle, bone, nerve, blood vessel, and organ in the body is free of restriction, the horse will move and behave in a completely different way. Myofascial therapy relieves soft tissue restrictions that cause pain. Some causes of chronic muscle pain are easier to diagnose than others: trauma from birth or a fall, cumulative posture misalignment , a compressed nerve from poor saddle fit, etc. When pain is caused by Myofascial tightness the diagnosis can be difficult, as fascia restrictions do not show up on MRI scans or X-rays. Yet, those restrictions can play a significant role in creating pain and malfunction in the structure of the back and legs. Every horse (and dog and human!!) should experience pain free movement that can result from having restrictions removed. This entry was posted in Equine, Equine Massage, Injury, Myofascial Release, Pain Relief, Performance Enhancing Massage and tagged fascia, muscle, nervous system on November 30, 2014 by Beverly Jacobs. will help the connective tissue become more elastic, thereby allowing the muscle to return to its natural shape. It is very important for horses to maintain a comfortable and free range of motion. If certain muscles are tight, other muscles in the body will compensate and take up the extra workload. They may be ridden like this for weeks, months or years, until the body can no longer call on extra resources because it does not have them. This ultimately leads to ruptures of soft tissues and thickening of the tendon and ligaments, which eventually can cause permanent dysfunction of the affected area. Muscles attach to bones in pairs of opposites, and cross one joint or more. Muscles free from tension will carry out the function of keeping joints in alignment. This allows joint fluid to flow evenly within the joint, and this reduces unnatural wear and tear of joints. Each muscle is attached to bone by tendons. Muscles are designed to take 90% of workload and tendons the other 10% The muscle is where the elasticity is. If the muscle is not functioning properly then the tendons will take more load and can eventually tear. Equine massage therapy is a very powerful tool in injury prevention for horses. This entry was posted in Equine, Equine Massage, Injury Prevention, Myofascial Release, Pain Relief, Performance Enhancing Massage, Sports Massage, Stress Point Therapy and tagged bone, compensation, joint, ligament, muscle, riding, tendon on November 11, 2014 by Beverly Jacobs.